The epic story of humanity’s battle for survival on a terraformed planet. Who will inherit this new Earth? The last remnants of the human race left a dying Earth, desperate to find a new home among the stars. 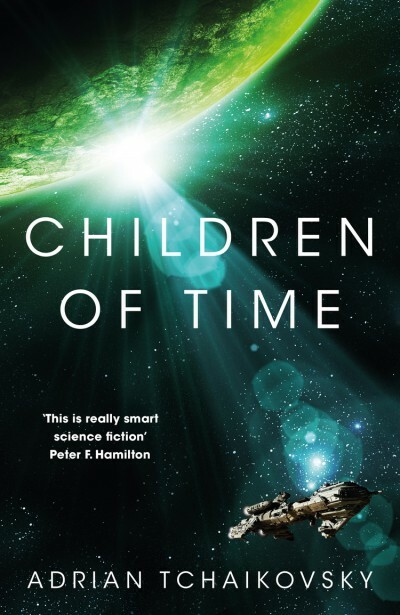 Following in the footsteps of their ancestors, they discover the greatest treasure of the past age – a world terraformed and prepared for human life. But all is not right in this new Eden. In the long years since the planet was abandoned, the work of its architects has borne disastrous fruit. The planet is not waiting for them, pristine and unoccupied. New masters have turned it from a refuge into mankind’s worst nightmare. Now two civilizations are on a collision course, both testing the boundaries of what they will do to survive. As the fate of humanity hangs in the balance, who are the true heirs of this new Earth? Long ago, Earth’s terraforming program sent ships out to build new homes for humanity among the stars and made an unexpected discovery: a planet with life. But the scientists were unaware that the alien ecosystem was more developed than the primitive life forms originally discovered. Now, thousands of years later, the Portiids and their humans have sent an exploration vessel following fragmentary radio signals. They discover a system in crisis, warring factions trying to recover from an apocalyptic catastrophe arising from what the early terraformers awoke all those years before. One of my favourite authors of SFF, Tchaikovsky has so many other excellent books to read while you wait for Children of Ruin. His backlist includes: the excellent Shadows of the Apt 10-novel fantasy epic (Tor UK); the Echoes of the Fall fantasy trilogy (Tor UK); the superb stand-alone novels Guns of the Dawn (Tor UK), Spiderlight (Tor.com), and Dogs of War (Head of Zeus); the novella Ironclads (Solaris) and The Expert System’s Brother (Tor.com); and the first novel in the After the War series, Redemption’s Blade (Solaris). We humans encounter the world through a very limited set of senses, compared to much of the animal kingdom. Our visual acuity is good but our ability to see colours is crippled by nocturnal ancestors. Birds, reptiles and many grounds of invertebrates see far more bands in the rainbow (if there was a mantis shrimp pride march their flags would be incredible). Our hearing and smell are the shame of Mammalia. What to us is a satisfactory baseline would make dogs cringe with embarassment. Adrian Tchaikovsky‘s Shadows of the Apt series is fantastic — so many fellow reviewers and SFF fans have waxed lyrical about his prose, his world-building and stories. Certainly, I thoroughly enjoyed the first novel in the series. I started it after the first four or five had been published, and while I was thoroughly taken with the series and characters, I think at the time I looked at the sheer number of pages involved in getting caught up and came over all read-shy… Shameful, really. As a result, despite picking up the whole series (some as ARCs, others I purchased to fill gaps), I have never finished reading it. I hesitate to set that for a personal goal, as I’m terrible at completing reading goals. Anyway, back to the purpose of this post. As you can see at the top, there, Tor UK has re-jacketed the novels (actually for the second time). I found them on Amazon UK. They seem to only appear for the Kindle editions, so it’s possible this is an eBook-only set of new covers. The city states of the Lowlands have lived in peace and prosperity for decades: bastions of civilization and sophistication. That peace is about to end. In far-off corners, an ancient Empire has been conquering city after city with its highly trained armies and sophisticated warming… And now it’s set its sights on a new prize. Only the ageing Stenwold Maker, spymaster, artificer and statesman, can see the threat. It falls upon his shoulders to open the eyes of his people — as soon a tide will sweep down over the Lowlands and burn away everything in its path. But first he must stop himself from becoming the Empire’s latest victim. Adrian Tchaikovsky is also the author of three stand-alone novels: Guns of the Dawn, Children of Time, and the upcoming The Tiger and the Wolf. I think I’ll be reading Guns of the Dawn very soon — I feel like reading something substantial, but not committing to a big (new) series at the moment. That novel looks like it will certainly do the trick. The last remnants of the human race left a dying Earth, desperate to find a new home among the stars. Following in the footsteps of their ancestors, they discover the greatest treasure of the past age – a world terraformed and prepared for human life. But all is not right in this new Eden. In the long years since the planet was abandoned, the work of its architects has borne disastrous fruit. The planet is not waiting for them, pristine and unoccupied. New masters have turned it from a refuge into mankind’s worst nightmare. Now two civilizations are on a collision course, both testing the boundaries of what they will do to survive. As the fate of humanity hangs in the balance, who are the true heirs of this new Earth? Denland and Lascanne have been allies for generations, but now the Denlanders have assassinated their king, overthrown the monarchy and marched on their northern neighbour. At the border, the war rages; Lascanne’s brave redcoats against the revolutionaries of Denland. Emily Marshwic has watched the war take her brother-in-law and now her young brother. Then comes the call for more soldiers, to a land already drained of husbands, fathers and sons. Every household must give up one woman to the army and Emily has no choice but to join the ranks of young women marching to the front. In the midst of warfare, with just enough training to hold a musket, Emily comes face to face with the reality: the senseless slaughter; the weary cynicism of the Survivor’s Club; the swamp’s own natives hiding from the conflict. As the war worsens, and Emily begins to have doubts about the justice of Lascanne’s cause, she finds herself in a position where her choices will make or destroy both her own future and that of her nation. 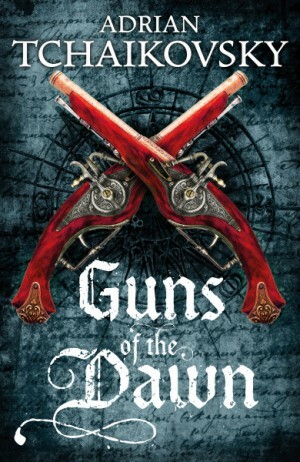 Guns of the Dawn is published in the UK by Tor Books, on February 12th, 2015. I can’t wait to get my mitts on it.